These elegant and stylish black hammock chairs are the perfect way to enjoy the outdoors from the comfort of your own garden area. 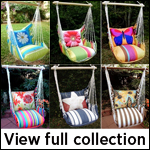 Relax in a stylish and sophisticated chair hammock that's comfortable and adds another eye-catching design to your garden. A variety of patterns and designs are available in this collection, each accented with a comfortable black and white seat cushion. Designs include the colors black, white and red and include flowers, roosters and elegant designs that are a great addition to any garden or outdoor area. 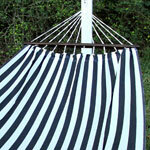 These outdoor hammock chairs are comfortable and a wonderful way to relax after a long day. Thick polyester cushions ensure comfort, while their machine washable properties ensure convenience. Each cushion is weather and mildew-resistant and won't fade. Weight is evenly distributed from a 33-inch wooden spread bar made from strong Chilean pine and easily hangs from a tree branch, patio or swing set. Each chair can support up to 250 pounds.